High School: #2 Lakewood Ranch Wins Twice on Saturday... Will the Mustangs Be the New #1? Lakewood Ranch could be the new #1 when the Extra Elite Eighty rankings come out on Wednesday. Two top-ranked Southern California top teams lost in the last few days—in college it was #1 UCLA falling to Oregon this weekend in Pac-12 player and in high school it was Norco losing its first game of the season as the Cougars lost to league rival Corona Santiago. On the high school front it will be interesting to see how the Extra Elite Eighty High School Rankings play out this week: is Norco’s strong resume in 2019 enough to keep Coach Rick Robinson’s team on top—they had previously beaten Santiago and are still ahead in the league--or will a team like previous #2 Lakewood Ranch from Bradenton, Florida move up? Lakewood Ranch (18-0) certainly can make a case for itself as T.J. Goelz’s team isn’t avoiding anyone with their schedule and Saturday was a prime example. The Mustangs scheduled Oakleaf (Orange Park, Florida) High, the #6 team in the latest Extra Elite Eighty, and Gainesville High, a state-ranked team in the Sunshine State, both on Saturday as part of the Special Saturday Doubleheader at Gainesville High School. “The goal was to schedule the best pitching we could in April to prepare for the playoffs,” explained Coach Goelz. “We had Gainesville with Alissa Humphrey (2020, Jacksonville), Oakleaf with Madi Davis (2019, Central Florida) and Cambria Arturo (2019, Jacksonville), and then face Academy at the Lakes with Lexi Kilfoyl (2019, Alabama) back-to-back-to-back. T.J. Goelz and the Lakewood Ranch Mustangs had to go 14 innings to beat Gainesville High. The Mustangs got all they wanted and more from Gainesville’s Humphrey who struck out 24 in the first game… and lost! 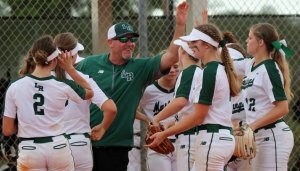 Lakewood Ranch and Gainesville battled for 14 innings before the Mustangs were able to score in the top of the 14th inning on consecutive doubles by leadoff hitter Jillian Herbst (2020) and pitcher/utility player Claire Davidson (2020, Auburn) which proved to be the game winner in the 2-0 victory.